Staff for HSR field survey: Rebecca Sheppard, PhD. 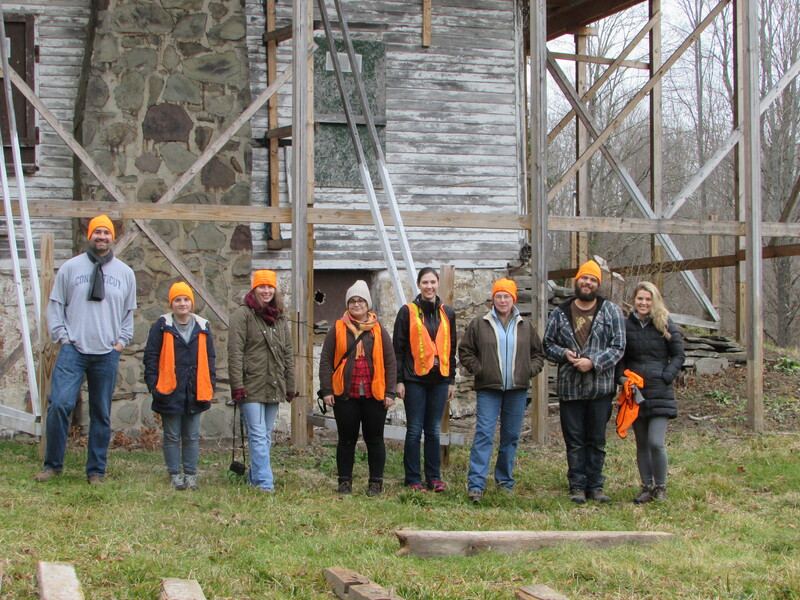 (third from right), Lauren Johnson, Kristen Herrick, Emma Gencarelli, Cathrine Morrisey, Michael Barni, Kevin Emmons, from the University of Delaware and Candice Myruski (fourth from right) from Commonwealth Heritage Group. Not shown – Philip Yocum, RA, NCARB from CHG.
During the winter of 2015, Rebecca Sheppard, PhD, associate director at the University of Delaware’s Center for Historic Architecture and Design and director of the Mid-Atlantic Historic Buildings and Landscape Survey and Philip Yocum, RA, NCARB, preservation architect with the Commonwealth Heritage Group (CHG) led a team of University of Delaware students in a preliminary field survey for a Historic Structures Report (HSR) on the Dennis Farm house. The team is studying the historic Dennis Farm house and barn complex ruins in preparation for the Historic Structures Report that is required before for physical restoration of the house can begin. They are continuing their work during the Spring 2016. The University of Delaware students’ hands-on involvement in the HRS field survey is another example of the DFCLT’s successful, ongoing educational mission. Funding for the HSR is made possible in part through a grant from the Pennsylvania Historical and Museum Commission (PHMC).